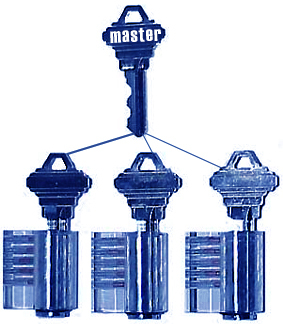 A Master key is one which is capable of over-riding all other locks configured in a master-key system, and opening them up to gain access. No other key in that same system would have such a capability, having only the ability to open the single lock associated with that key. There are some obvious advantages to a landlord or property manager in having a master key system installed for a given building, since it would allow access to all individual apartments within the building, and provide emergency access when needed. But installing a master key system also calls for some responsible control measures on the part of the holder, just because of the power it wields. The worst-case scenario with a master key system would probably be to lose the master key itself, or to have it found or stolen by someone with malicious intent. Someone holding that kind of power could access any apartment in a building, and be free to cause damage, remove objects at will, or even to bodily threaten occupants of the apartment – all while leaving no visible traces of entry. This means that only the most trusted individuals should be given access to a master key, and that the location of a master key should only be known by someone who has the complete confidence of the landlord or property manager. All other locks in a master key system can be completely changed out without affecting the access of the master key, and this allows a property manager to change locks after a tenant leaves without having to disrupt the master key system itself. That is just the kind of flexibility needed for large apartment complexes, where tenants routinely come and go. Security can be maintained in the master key system, without having to undergo the constant expense of changing the master key system itself. On the negative side, an improperly designed or constructed master key can lead to the possibility of a knowledgeable criminal subverting the master key and gaining access to an entire building. This is because of the inherent nature of master key systems, in that the locks themselves are much easier to pick than individual locks, and a professional thief is often aware of this fact. While the convenience aspect of master key systems is unquestioned, from the standpoint of security, high security locks may be better options than multi-lock systems, especially in situations where entry to buildings could potentially be an issue. To install the right kind of security system for your apartment building which incorporates both convenience and security, you should contact your commercial locksmith and discuss your needs with an expert.